Any business or an organization is said to be successful only if their productivity is always on the peak. Office space in an organization is very important place to be maintained and designed well as that is the place where most of the employees stay for a long period of minimum 8 hours. It is the duty of the organization to make them comfortable and ensure a pleasant working space. This post is all about few design tips to make your office more productive and organized. Designing a work space should be in a way that it makes an employee physically as well as psychologically comfortable. According to recent studies, it has been seen that an employee’s ability to work productively has a direct relation to how the employee focuses their physical environment. Here are the most popular and hand-picked design tips to make your work space more productive. A well lit and airy office sets up for basic well designed office. When you have hired a new space or built an office, make sure they have good ventilation. There should not be any kind of irritability or packed up feeling when the place is crowded. Also, regulating temperature is very important nowadays as there is a non stable climate most of the times. For example, when the climate is too hot or cold, it is good to have insulators to reflect light as well some good cold resistance windows. Having good quality air can make drastic changes not only to the employee’s health but also helps in increasing their focus and productivity. Try to ensure that there is good quality air circulating inside the office. If your office is a closed space, then try installing air filters and air purifiers to increase the quality. Adding small plants is also a great way to provide good air circulation within the office space. All of us know the power of colors especially on our mood and brain function. It is been scientifically proven that there are certain colors which impact good spirit, wellness in the room. Choose mild and subtle colors which brings positivity to the workplace. For example yellow is the color of sunshine which brings energy to the room. And also remember colors like blue or aqua marine are considered as not so good options as it denotes something illegal. Having colors around us that affect our productivity and output in a positive manner is very much necessary during work. It triggers a sense of physical and emotional stimulus within a person and encourages the person to do more work efficiently. If possible, employees can also bring certain items that have colors which help them to work better, such as postcards, small figurines or journal cutouts. Keep in mind that too much of a color can also have the opposite effect on employees and can also make them dull. Hence choose good colors which suits for the space. Remember to always keep it minimal and never choose colors which distract the work environment. There is always a natural grace for the color green where ever it is been decorated or adorned. Adding green plants or some indoor plants will revamp the mood of the employees as well it will create a refreshing feeling. It is a great choice for decoration purpose as well as for ecological balance of the building. Also, as mentioned above, another added advantage of adding green plants inside the office space, increases the quality of the air and adds a sense of freshness to the dull office atmosphere. If you do not have any form of plants to bring in, then try to make sure that you have a picture of nature or you can keep it as a screensaver or the desktop wallpaper of your work computer. This will help you feel calm and composed and will allow you to be more focused on your work and tasks. Never compromise with good quality furniture. The role of good chairs and desks are more than needed than any other furniture. Choose good ergonomic chairs instead of cheap ones to avoid bad physical health conditions like neck and back pain complaints from the employees. Having chairs that suit the structure of the back is a good addition to the office space, since employees can feel more comfortable and less stress is given to their backs during work. Also make sure how some variations on the normal work space and meeting areas gives a fresh feel. Use adjustable tables and chairs to suit each employee’s preference. Furniture occupies some of the most important aspects of designing a productive workspace. Remember minimal is the best design ever. Always opt for a closed shelves and desks to fit in all documents and most important accessories of a system. Never use luxurious statues on the floors or any kind of accessories. This will spoil the mood as well as create cluttered feel. Add some stylish, yet simple file organizers or interesting trash bins to make employees motivated to keep the place clean and organized. 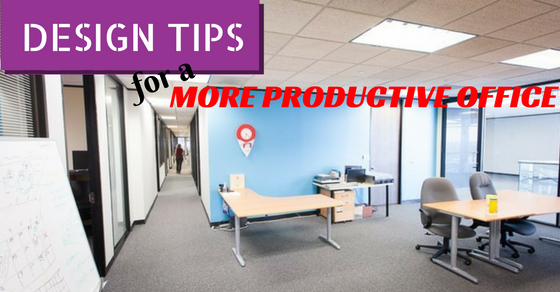 Also, try to add variety to the various office spaces so that the employee can feel refreshed and energized when they do their work. Having uniformity in the office structure makes employees feel entrapped inside a closed area and they might even get distracted from their work. Moreover if you feel that your workspace is very small and congested, then think about the various ways in which you could try and brighten up and make it more personalized. Try to find creative ways to do so. Lighting is one of the most important necessities in the office to make the employees feel more relaxed and focused in their work. Lighting can have both good side and bad side. Good lighting can improve the performance of the employees while bad lighting can cause bad eyesight, headaches and also fatigue to employees. So think carefully while investing on the right type of lights. For more effect, you can use natural lighting bulbs or you can use light therapy for making the employees more relaxed during work. Sometimes you need to highlight or differentiate some corners or casual sofa’s to have a relaxed feel. Use interesting artificial spot lights or invest in good quality led lights to make employees feel rejuvenated. Make sure that this does not go overboard, and at the same time choose something classy. Try to find lights that perfectly fit with the ambiance and the environment of the office space and at the same time does not produce any discomfort to the employees. Adding scents or fragrance to work space is little tricky concept. But if it is been used proper, it gives a fresh feel and also sometimes the fragrance itself sets the mood of the working environment. Scents are not usually used in many offices, since each person reacts different to a certain type of smell. Try to find room scents that are loved by a majority of people and use that in mild quantities inside the office space. There are so many mild floral room mists available in the market which can be surely taken as a choice to make your office space smell good. Be little cautious, not to make it over board as sometimes strong fragrances might give a headache. Make sure that the employees approve of the scents before using inside the office. To add a more natural touch, use natural scents instead of artificial ones. For this purpose, you can use essential oils or scented herbs. It is natural that most of the work spaces are always crowded and there is so much noise which reflects and spoils the environment. Recent studies have shown that increase in the noise level within an office space can have drastic effects to the personality and performance of the employees. Noise not only is distracting to many, but it can significantly increase stress levels for workers. Hence, drastically affecting the performance levels of many employees. Design the office environment with many noise pollution panels to absorb sound, as well use sound absorbing sheets in and around meeting rooms to avoid noise pollution. It has become common that few employees tend to smoke nearby office premises. To avoid such embarrassments and to avoid passive health issues it is suggested to create a smoke area away from work space, which is good for productivity as well as healthy work environment. Make sure that you have air purifiers installed inside the office so as to collect smoke and dust particles that can cause discomfort to many employees. Even though cafeteria is a space dedicated for leisure, this is a place which needs more maintenance and better design to look more spacious as well as well lit. Invest in some bright colored furniture which is light in weight and easy to move around places. Never design this room in a closed manner so that employees might feel congested. Try all means to make it look more naturally lit and airy. Check and ensure that the cafeteria is selling foods such as nuts, fruits and also coffee and tea and other refreshing beverages that helps the employees to re energize and focus more on their work. Hire or build an office space with huge French windows. When in case it is not possible use light colored curtains. Drapes with very light in weight is mostly preferable as it naturally gives a breezy and well lit rooms. You can also use some light natural bamboo curtains instead of cloth drapes to add more richness to the design. Often meeting rooms are designed similar to work spaces. You can also use different colors; different style of furniture to highlight the meeting rooms and it also creates a lot of impact on the mood switch from work to discussions. There are many ways to motivate employees in the work space. But simple way is through having an interesting and motivating wall posters or wall hangings which creates good vibes. You can also opt for simple quote wall posters or sayings of famous leaders or some quotes of the own organizational head. Also, keep in mind not to use any posters that can encourage illicit thoughts and ideas within the employees. Make it simple, elegant and effective. This design tip might not be suitable for all organizations because of the limited space available as well as it also depends upon the organization’s decision. But from design and psychological part of view, a better peaceful environment is one which is little private, motivates an employee to take better responsibility of the job. So, if it is possible, design the work space with many private bay for employees to cheer them to have an own space in the office. Designing a work space does not only depend upon the creativity of the designer but it also should be in a way which does not spoil the mood of the place. Especially, the overall soul productivity should not be disturbed by its fancy looks. Hope this post helps in suggesting few very casual ways of designing an office to be productive as well as stylish.